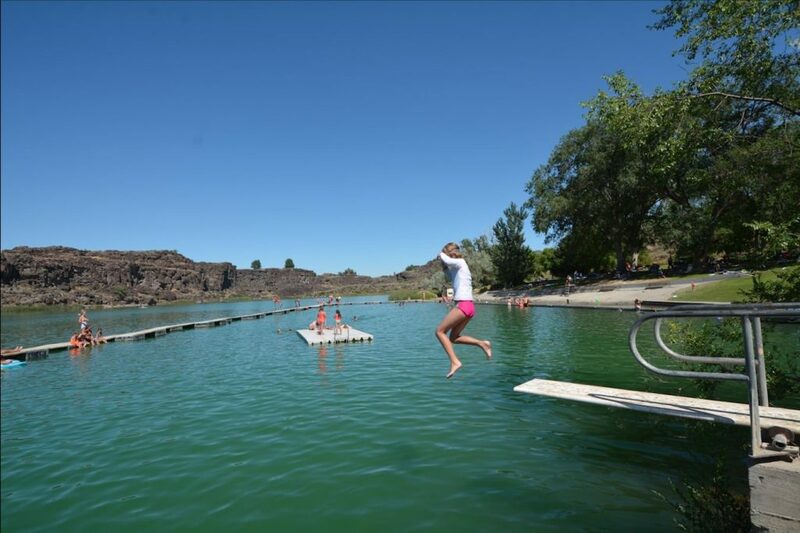 Feeling’ good, feeling’ strong in Twin Falls Idaho and Idaho State Parks. And we couldn’t have asked for more as we begin to really lean into our hiatus from the live-to-work scenario. Known as “the Niagara of the West,” Shoshone Falls is real mindblower! It wasn’t even running at its full capacity and the sheer power of it was staggering. 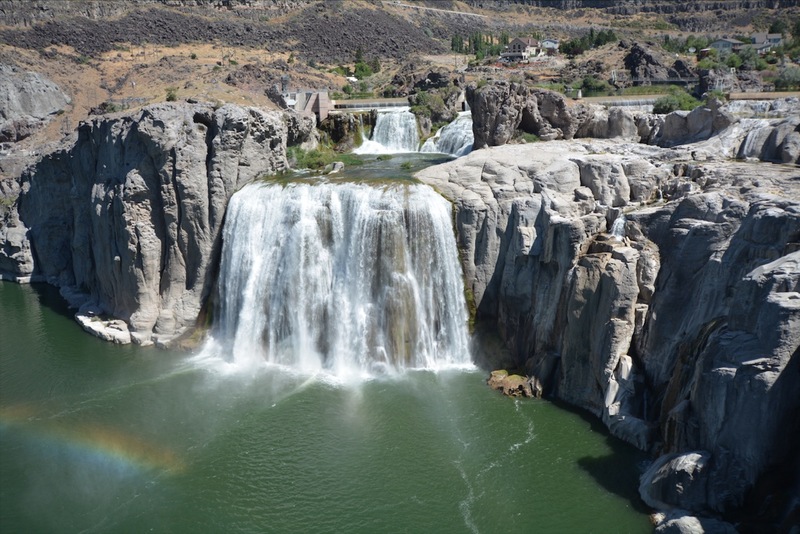 Shoshone Falls in southiern Idaho is known as “the Niagara of the west,” and for good reason! Part of Shoshone Falls park is the Dierkes Lake swim area. Dierkes was an amazing spot for swimming, diving, and cliff jumping. The water was cool and clear blue. One of the best we’ve experienced. 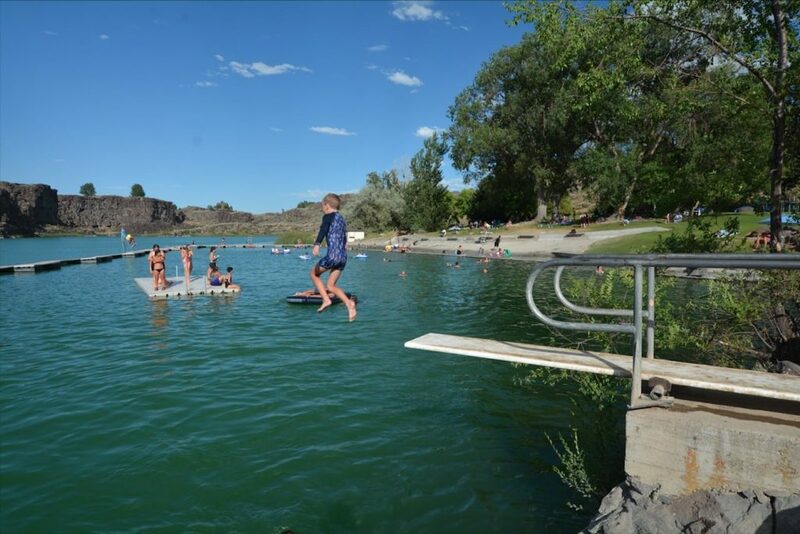 A multifaceted recreational area, access to Dierkes Lake is included in your admission into Shoshone State Park. There were a lot of people here, but far from crowded. The water, beach, and surrounding cliffs were all amazing! 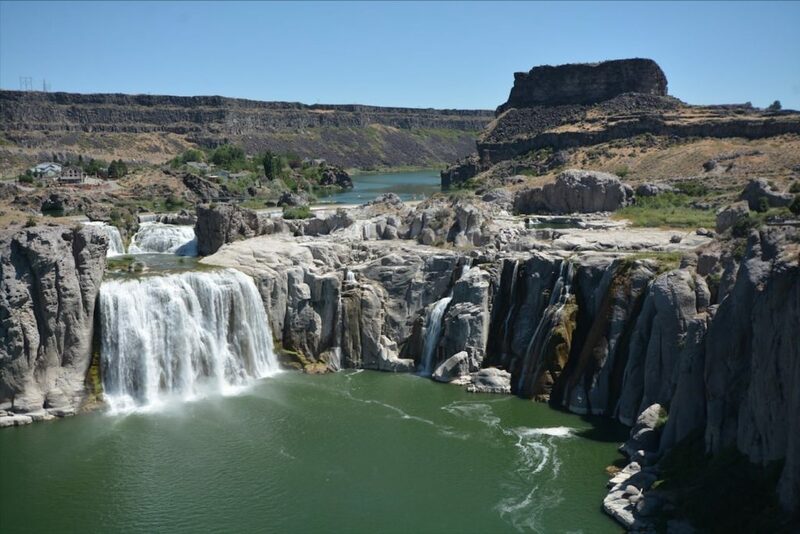 Both Shoshone Falls and Dierkes swim beach are blockbusters you mustn’t miss on your trip through souther Idaho. The admission fee into the park, a humble $3 per car, could easily be tripled or quadrupled and still be more than worth it. And if that all weren’t enough, there is yet another special feature in this park. Hidden Lakes are just a short walk up the trail and around the corner from Dierkes. We didn’t swim or cliff jump in the series of small, clear green lakes – nor did anyone else while we were there – but we heard its possible. There’s a strong feeling of privatization in this area, with private homes strewn along the landscape. In some other place, I’d have expected the area to be fully state owned. But not here. 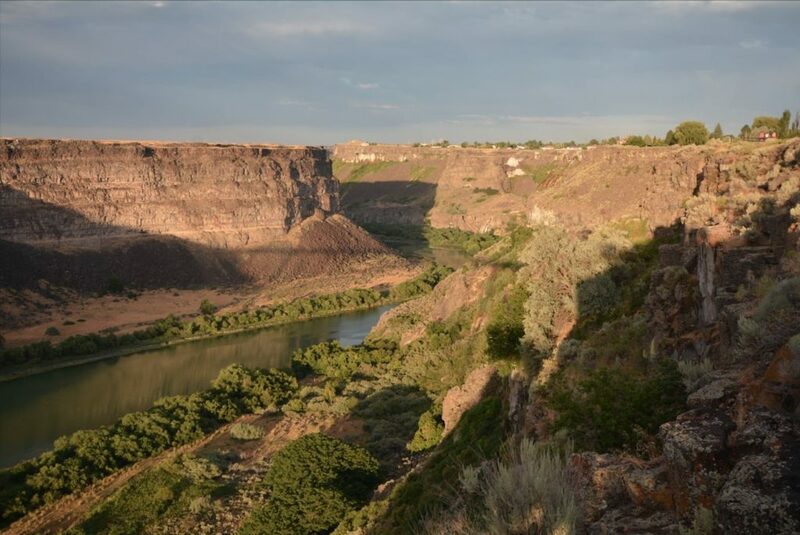 Snake river canyon rim is spotted with large and luxurious homes. They’re colored to ensure they match their surroundings, and thereby blend in with the scenery. But they’re there, nonetheless. This is not a recent phenomenon, either. 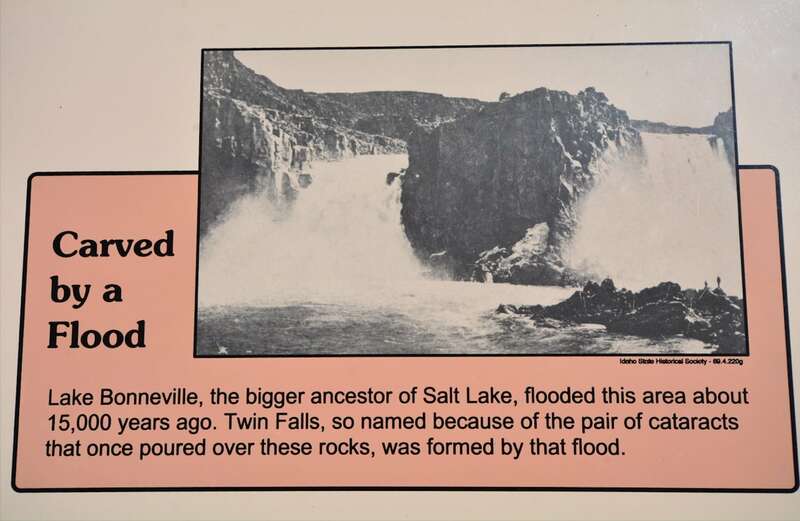 You might even say that leveraging the canyon for human use is a heritage of Twin Falls. This phenomenon can be seen clearly in the “blind cataract” of historic Twin Falls, itself, which we visited our second day in the area. One of the two original cataracts was dammed and topped with a power station in order to deliver power to the city and surrounding areas. From the point of view of a nature lover, its kind of sad to witness the current truncated state of this natural beauty. But such are the needs of humans in their surroundings. Such is life. Twin Falls is not alone in this regard. And its still amazingly beautiful in its own special way. A signboard at Twin Falls state park shows a historic photograph of the original double falls, as well as info on the Lake Bonneville flood which created them. I.B. 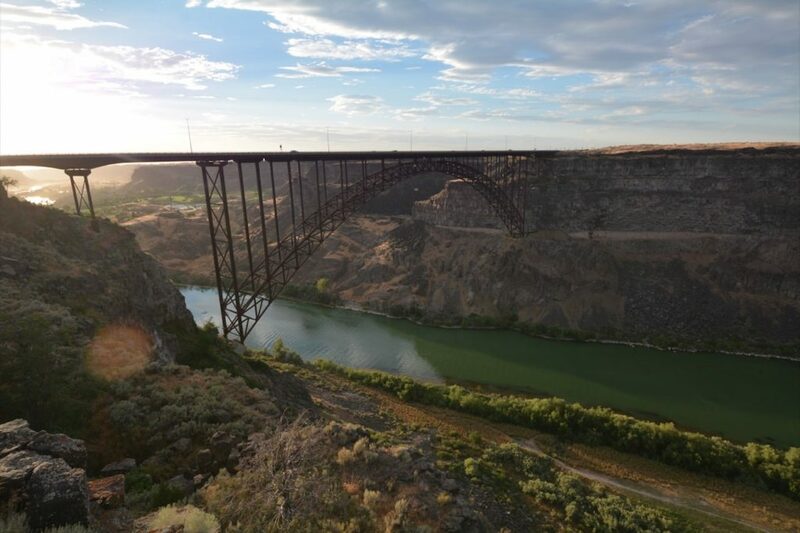 Perrine Bridge spans the Snake River Canyon in the city of Twin Falls. Its a huge steel truss-arch bridge that’s over 1000 feet long and almost 500 feet high above the mighty Snake. 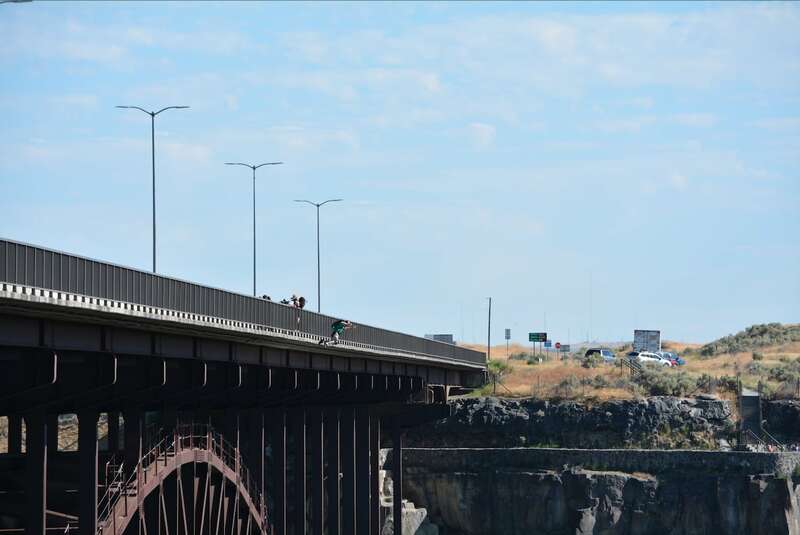 Perrine Bridge is one of the few structures in the US where BASE jumping is legal. To hear our couchsurfing host say it, “they’re going to do it anyway, so why not make it legal. Enlightened, indeed. 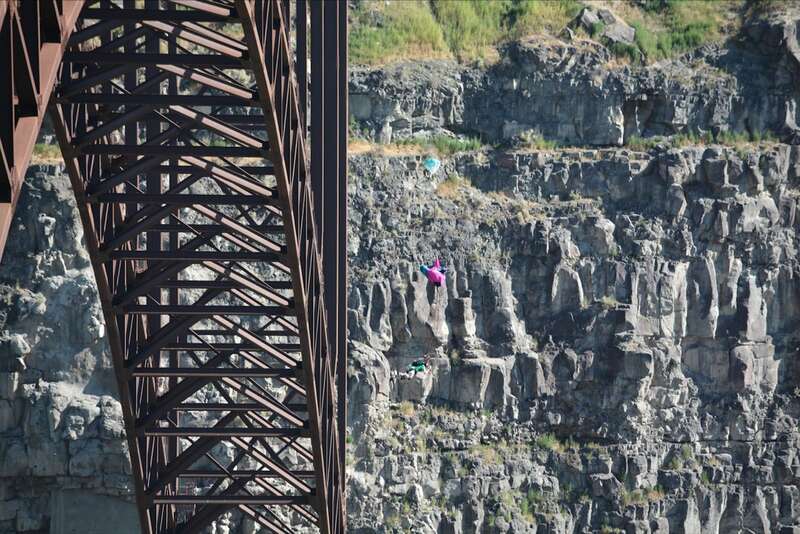 We saw a few BASE jumpers get busy while we were standing around admiring the bridge. It was about 8:00p, but the was still up, in spades. Love the long days of summer. Its hard to imagine the adrenaline rush the fellow above must have felt in the few seconds after jumping, and before his chute fully unfurled. Easy sailing from here on down. 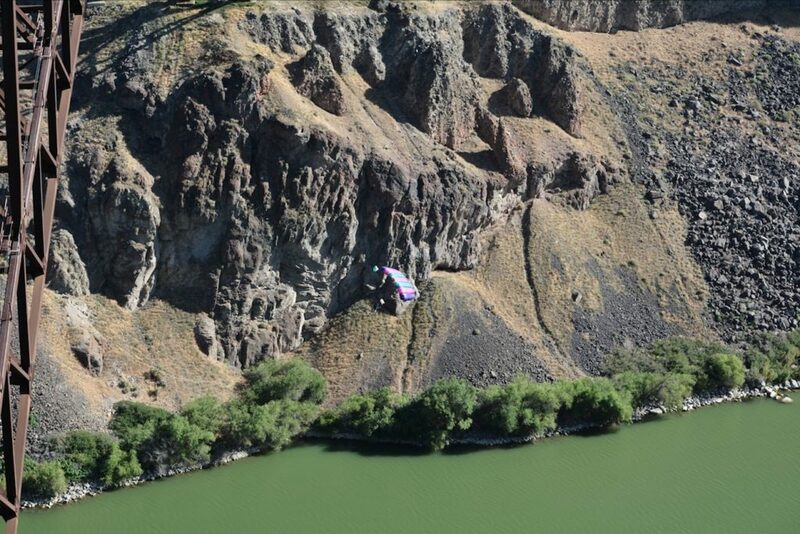 With his chute fully deployed, the BASE jumper above floats casually toward the surface of the Snake River below. When all was said and done, he’d actually landed on the bank of the river. 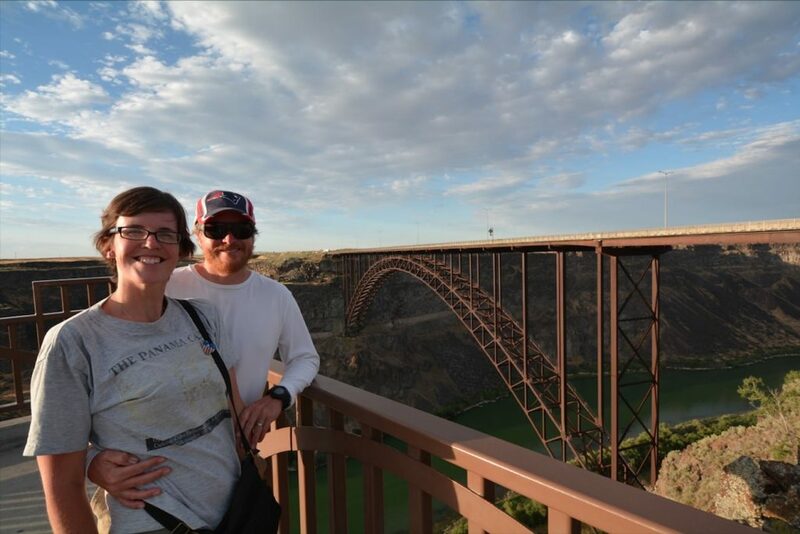 There was so much yet to do, and to enjoy in the Twin Falls area, we felt like we were leaving prematurely. 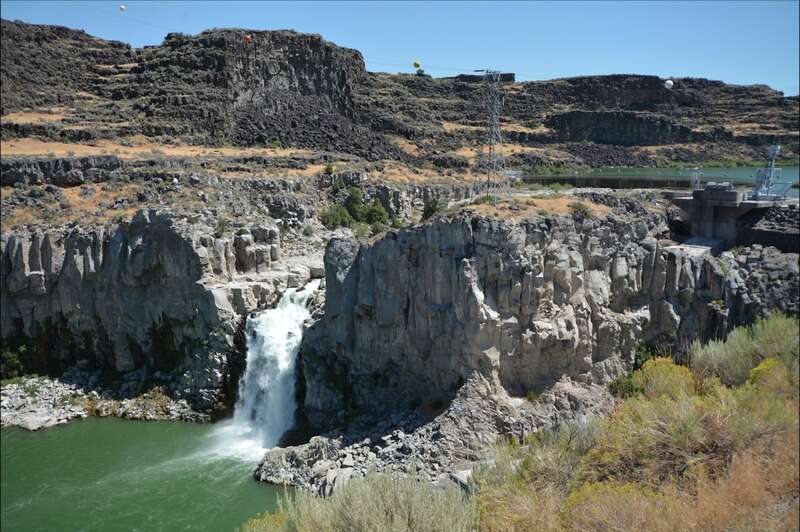 Among other things, we’d wanted to kayak to the base of Shoshone Falls. However, didn’t feel like we’d be able to comfortably make the miles-long paddle from the put-in below Perrine Bridge. We hadn’t kayaked, yet, this season (or at all, ever, for that matter), and we knew the paddle would be super strenuous. We’d be on a time schedule (the kayaks are by reservation, only), to boot. All of which was a recipe for disappointment, one way or another. 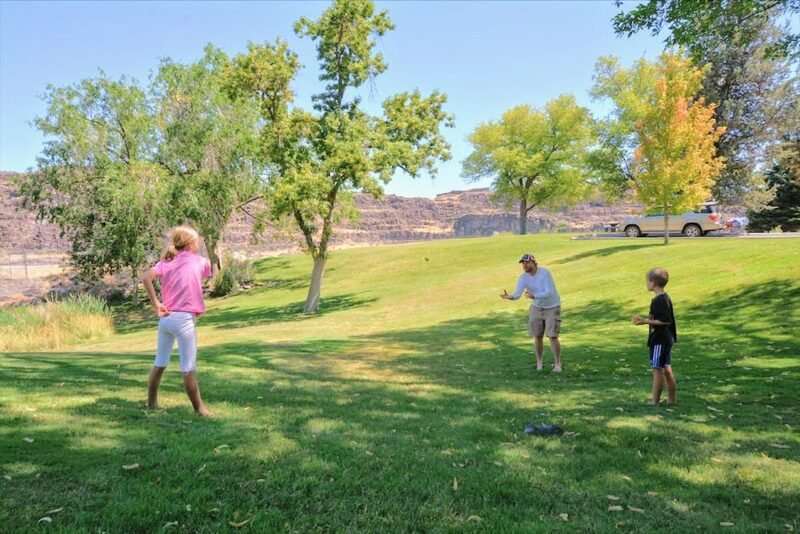 We spent 2 full days just hanging out and relaxing in the cool shade and plush lawns of the two state parks (Shoshone and Twin Falls). We played and ran, stretched and performed yoga, leisurely ate and napped. Even still, we felt we had too little time to really enjoy the place. We had a lot ahead of us to see (almost all of the pacific northwest and Canada), and had to get a move on. On so many occasions during our travels, we’ve had to “leave a little on the table,” in terms of stuff we didn’t get to do, but wanted to, when visiting a place. Again, such is life. And such is travel. They say that perfectionism is a disease, and it would be a real shame to stay disappointed over not getting to “do it all.” Or worse, never trying because you knew couldn’t get it all done, anyway. The way we look at it is, this gives us a very compelling reason to return to a place. And return to Twin Falls, Idaho, we will, for sure. 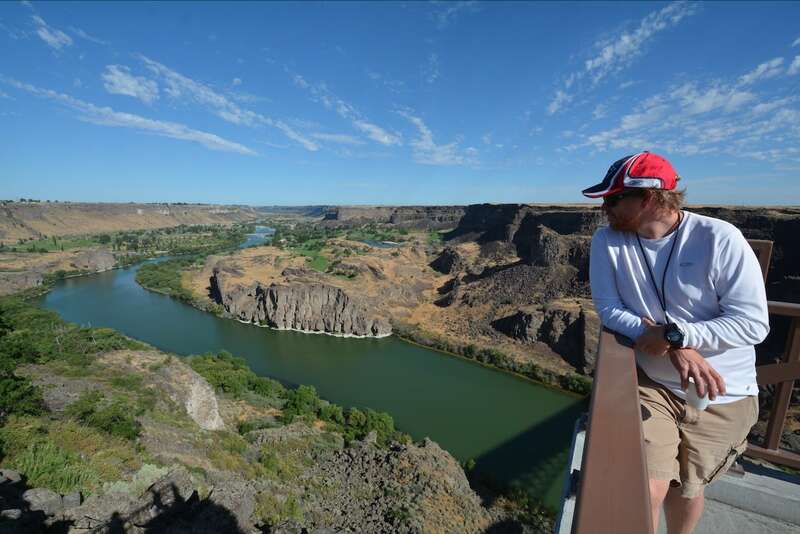 Twin Falls and the Snake River Canyon are just too chocked full of killer opportunities for outdoor adventures. The landscape is surreal, and the people are hospitable. We send out a couple of communications each month that we’re sure will add value to your journey.We’d love for you to be on our email list. Its private and personal. We don’t know how to spam or sell your email, even if we wanted to (We don’t.). It’ll be fun, and you can unsubscribe any time you like. Let’s Rumble!